Michael Pollan’s insightful and simply-stated Food Rules have become well-known, especially his easy-to-comprehend mantra: “Eat Food, Real Food, Not Too Much, Mostly Plants.” One of his rules that comes to my mind, on nearly a daily basis, is a rule which helps me to avoid overeating: “If You’re Not Hungry Enough to Eat an Apple, Then You’re Probably Not Hungry [emphasis added].” This rule also prompts me to eat an apple instead of some other type of snack. Nhat Hanh, with his co-author, Dr. Lilian Cheung, a nutritionist, lecturer and researcher at the Harvard University School of Public Health, in Savor, Mindful Eating, Mindful Life, address the problem of obesity that is spreading across the globe with more than a billion people worldwide, overweight. According to a recent report of the Centers for Disease Control and Prevention, the obesity rate in the United States is a startling percentage of the population. By state, obesity prevalence ranged from 20.7% in Colorado to 34.9% in Mississippi in 2011. 39 states had “obesity prevalence” of 25% or more; 12 of these states had a prevalence of 30% or more: Alabama, Arkansas, Indiana, Kentucky, Louisiana, Michigan, Mississippi, Missouri, Oklahoma, South Carolina, Texas, and West Virginia. Nhat Hanh and Dr. Lilian Cheung make a strong case that “mindless eating” is a driver of weight gain and obesity, while acknowledging that eating less and exercising more is “easier said than done.” By combining Buddhist philosophy with the science of nutrition, they provide a way to understand our bodies and mind in order to counteract the “societal forces that drive us to eat more and move less.” They are not afraid to critique the food industry which “wants consumers to consume” and uses advertising to promote a culture of constant snacking, drinking and eating. They note the research in neuroscience and psychology, cited in Dr. David A. Kessler’s The End of Overeating, Taking Control of the Insatiable American Appetite (Rodale, Distributed to the trade by Macmillan, New York, 2009), which established that foods high in fat, salt and sugar alter that brain’s chemistry, stimulating release of dopamine, which is associated with feelings of pleasure. Savor offers an approach to weight loss and healthy eating, which is fresh, spirited and mindful of the miracle of food. Hanh and Cheung smartly weave together scientific and spiritual recipes for weight loss and creating a healthy lifestyle. Their focus in not simply on calorie counting or exercise regimens, but also on creating awareness around eating. The book’s three parts, (1) A Buddhist Perspective on Weight Control, (2) Mindful Action Plans and (3) Individual and Collective Effort are filled with meditations, poems, and exercises to bring one into more awareness. The book’s second part, Mindful Action Plan, includes three chapters: Mindful Eating, Mindful Moving, and Mindful Living Plan, which explain step-by-step how to identify goals and monitor progress. Mindful Eating sets out the basics of healthy eating in simple language: “Choose foods and drinks that are good for our health and good for the planet, in the modest portions that will help us control our weight.” To pick the healthiest sources of protein, both for the individual’s own welfare and for that of the planet, the reader is advised to choose plant-based proteins from nuts, legumes, seeds, and beans, and “If you do have to consume animal foods, choose fish or chicken.” Red meat and dairy products also “take a terrible toll on the environment,” and if you have to eat red meat, the authors advise that “it’s best to limit yourself to no more than once or twice a week.” They note that “Some scientists have estimated that it takes one hundred times as much water to produce a kilogram of beef as it does to produce a kilogram of protein from grain [emphasis added].” According to information from the National Geographic’s Freshwater Initiative, one pound of beef requires 1,799 gallons of water to produce. “You may notice one vegetable that is conspicuously absent from the list of rainbow-colored vegetables: the potato. While multiple studies have shown the benefits of eating fruits and vegetables, potatoes do not seem to play a role in these observed protective effects. That’s because potatoes- whether their skins are brown, red, yellow, or purple – have more in common with white bread and white rice than they do with broccoli or bell peppers. Potatoes contain rapidly digested starch, and large amounts of it. The book’s chapter on Mindful Moving builds on the authors’ view that regular exercise is “close to a magic potion” and that “being active is one of life’s miracles.” They note that exercise not only helps prevent weight gain and obesity, but also lowers the risk of many chronic conditions including diabetes, heart disease, high blood pressure, unhealthy cholesterol, certain cancers and osteoporosis. In addition, exercise has been shown “to boost mood, improve quality of life, and help people better deal with life’s stresses.” Savor even includes an Appendix D which lists more than 50 creative alternatives to television watching. 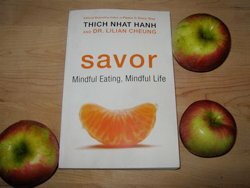 Sara asks “Is it any coincidence that the first teaching that the Buddha made after becoming enlightened refers to the most basic act of being human – our need to eat?” Further, this first teaching of the Buddha explains why the artwork on the cover of Savor shows a slice of tangerine instead of an apple! “This sanctuary explores the interaction of Buddhism and farming alongside the shores of the Pacific Ocean. 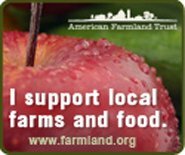 Meandering through the farm we felt the stillness and peace of those committed to the spiritual act of land-based labor. Statues of Buddha adorned the fields and greenhouses. We observed the meditative quality that the farmers exuded while planting, watering, weeding, harvesting, and pruning the orchard. We could only imagine the dining hall and the attention that would be given to the act of eating.